Photo by Juliana Lauletta from the Londonist Flickr pool. 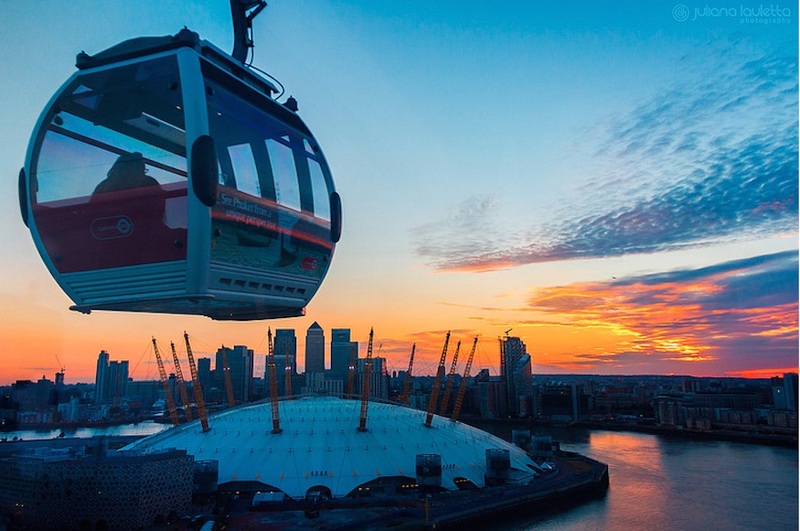 The Emirates Air Line still has no regular Oyster card commuters, three years after the cable car between North Greenwich and the Royal Docks opened as a “a much needed new connection across the Thames”. 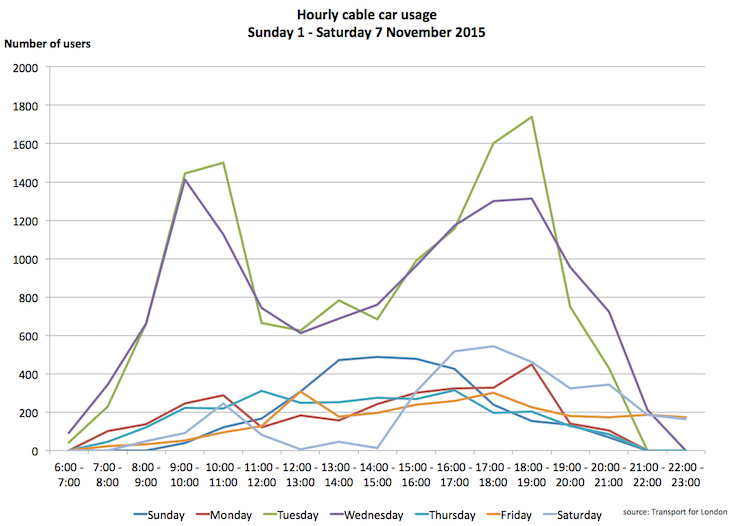 A study of a week’s travelling patterns show that trips on the cable car, which charges premium fares and does not accept Travelcards, are slightly up after TfL extended its opening hours this spring. While usage of the cable car got a boost from November’s strike on the Docklands Light Railway, even free travel for DLR users couldn’t lift passenger numbers to the levels seen during the Olympics and Paralympics. 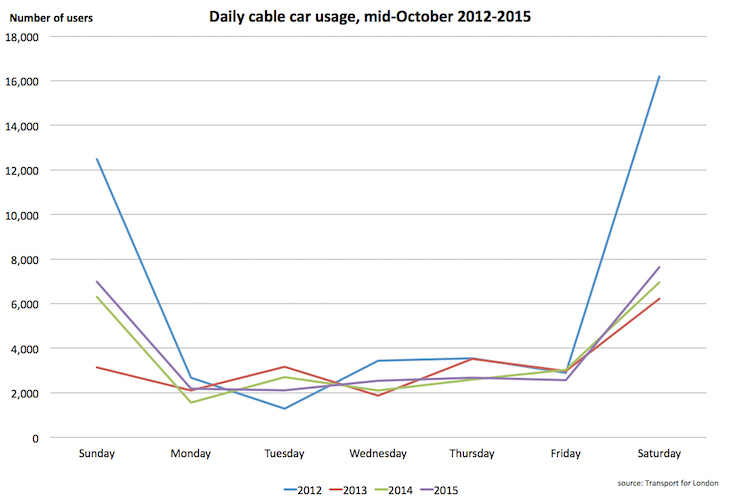 It’s the fourth year TfL has supplied detailed user figures for a week under the Freedom of Information Act, with this year’s covering 11-17 October. Does anyone use the cable car regularly? Regular commuters who use Oyster card more than five times in a week are given a 50% rebate on their fares. However, it’s the second year in a row that no Oyster users have been recorded as taking advantage of the scheme. In the equivalent week in 2013, just four people used the scheme, compared with 16 in 2012. That’s not to say there are no regular users at all — some use paper multi-trip boarding cards, which cost £17 and are valid for 10 trips. However, as the paper tickets are valid for a year, it is clear how many are using these tickets get to work, and how many are just planning a number of day trips. Usually, just a handful are sold each day. 25 of these tickets were sold between 11-17 October — three fewer than in the same week last year. Analysis of daily sales since opening day, 27 June 2012, suggest about 30 multi-trip boarding cards are sold each week. Spikes in sales occur almost at random. 73 were sold on the Air Line’s first Sunday of opening, 1 July 2012, and 51 were sold on both 21 and 22 September 2015. It’s not immediately clear what was behind the boost in sales in September as there were no big events on at the O2 or the ExCeL centre. Overall, TfL only sold £110,000 worth of multi-trip tickets between June 2012 and October 2015. Journeys in our sample week in October are slightly up on last year — 26,664 compared with 25,271 in the equivalent week in 2014. But ticket sales remain well down on the heady days of its first year when even TfL admits to its usage being boosted by the “novelty factor”. 42,463 people used the cable car in the same week in 2012, when it still had that post-Olympics glow. If the cable car has failed so far at being a form of public transport, TfL has tried to capitalise on its novelty factor, slowing journeys down and adding commentaries. But this year’s small rise appears to be largely down to TfL’s decision to extend the cable car’s opening hours, moving its closing time from 8pm to 9pm on weeknights and 11pm at weekends. This has clearly boosted the vital weekend numbers — there were more passengers on the cable car on Saturday between 8pm and 9pm than during any hour on the previous weekdays. But there have also have been sharp drops in sales of tickets aimed at tourists. 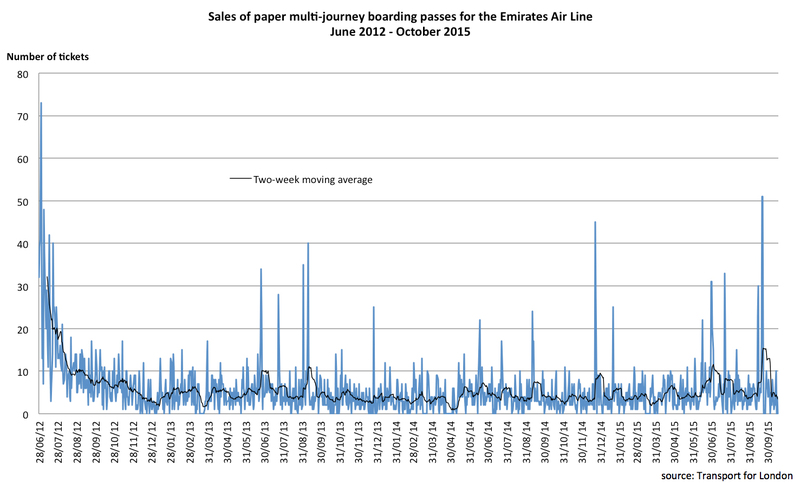 Combined “experience” tickets, which allow admission to the Emirates Aviation Experience at the Greenwich Peninsula terminal, were down from 5,292 sales in the same week in 2014 to 4,099. Sales of tickets allowing travel on the cable car and Thames Clippers river buses were well down in our sample week, from 539 in 2014 to 291 this year. Last year, two people booked private cabins for group rides. Nobody took up the £90 offer in our sample week this year. 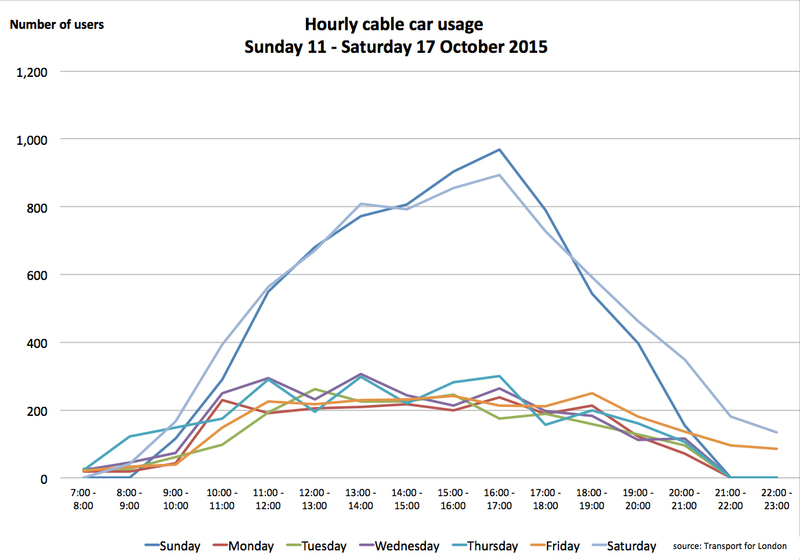 What does the cable car look like with a rush hour? The Emirates Air Line accepted DLR tickets during its strike on 3 and 4 November. It was only the fourth time ordinary tickets were valid on the cable car — the other times during the tube strikes in July and August, and during a Jubilee line suspension on 25 August. This was partly to help people travelling to the World Travel Market exhibition at ExCeL, and the flows of passengers reflect this, travelling north in the morning and south in the evening. TfL also supplied usage figures for the week of the strike. Passenger numbers peaked at 1,739 between 6pm and 7pm on the strike’s first day — dwarfing the weekend numbers. But even these figures don’t get anywhere near the Dangleway’s top 20 busiest days — all of which came during the Olympics and Paralympics, or in the build-up. So is the cable car making money? Yes, according to TfL — but not a lot. It’s worth remembering the cable car cost £60m to build, with Emirates paying £36m in annual instalments over 10 years for naming rights. A further £8m came from the EU. TfL has always said it aims for the cable car to pay back the remaining £16m in fare revenue. Transport Commissioner Mike Brown’s most recent report to the TfL board says the Emirates Air Line has made a £1m surplus since it opened. “This is expected to grow with passenger journeys as the local area develops and awareness of the service increases,” the report says, adding that it aims to pay back the build costs by 2022. Judging by the figures so far, the Emirates Air Line’s user numbers are going to have to increase very quickly if those costs are to be paid back by then. What to do with Boris Johnson’s Dangleway may prove a headache for whoever’s elected as the next Mayor. Chart graphics by Clare Griffiths.